Rust versus rest! You would be right to forget about the pregame narrative after watching the Thunder wax the Lakers last night, but outside of the Metta World Peace vs. James Harden story line, the dominant discussion leading into (and through the early stages of) Game 1 was how the Thunder would play after their nine-day break following their sweep of the Mavericks. Of course, the way the Thunder played might write off any rust-related discussion for a while, but it’s an interesting question to ponder: Do NBA teams really get rusty after long postseason layoffs? One way to make the case for rust is to absolutely fabricate a story about being rusty. That’s what Shaquille O’Neal did during the pregame show, when he mentioned that his 1994-95 Magic team, the one that had beaten the Bulls during their playoff run, promptly received 17 days off before playing the Rockets in the Finals. There, a rusty Magic team couldn’t compete with Houston in Game 1 and eventually, according to Shaq, lost the series because of it. The Magic didn’t get 17 days off at any point during the postseason. After beating the Bulls, they got four days off before playing the Pacers in the Eastern Conference Championship (and won Game 1). Then, after beating the Pacers in six games, they had two days of rest before beginning their fateful series with the Rockets. The Magic were swept by the Rockets, four-love. Were they rusty all series? In fact, the Magic weren’t even rusty in Game 1. They blitzed the Rockets early and got out to a 30-19 lead by the end of the first quarter and a 61-50 lead at halftime. If your team is really afflicted by rust, why would you be on fire during the first half and then suddenly get rusty during the second? Maybe O’Neal had an out-of-body experience. Since 1986 (as far as basketball-reference.com‘s data goes back for the playoffs), no team has ever had more than 10 days off during the playoffs. Shaq had eight days of rest on two separate occasions, but both those situations came while he was on the Lakers. His teams did lose both of those games, with the more notable loss coming at the hands of the 76ers during Game 1 of the 2001 Finals. 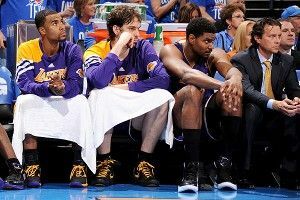 The Lakers were so agitated that they promptly won the next four games. Maybe Shaq was just trying to subtly troll Reggie Miller and imply that the games against the Pacers were pushovers. And it’s okay to screw up a fact here or there doing live TV, of course. But it sure looks like Shaq invented an alternate universe that bears no resemblance to reality, and then used that alternate universe to lend expert analysis into why the Thunder might struggle in Game 1. Not so much. (Opener is Game 1 of Round 1 for the team in question, which always occurs within four days of the team’s final regular-season game.) It’s not a very large sample, with just 148 games featuring a team getting four or more days of rest over 25-plus years of playoff games, but those teams are winning about 55 percent of the time. They sure don’t look rusty. The problem with that figure is that the sample is biased toward great teams. Teams who get a long rest during the playoffs are almost always getting that rest because they swept somebody in the previous round. Of course, a great team is more likely to sweep the opposition than an average team or a poor one. Combining that with the small sample of games makes it impossible to say that rust doesn’t exist. On the other hand, it’s hard to find evidence supporting that it does. When Basketball Prospectus’s Kevin Pelton ran the numbers on a similar study in 2008, he found that every game that a team didn’t have to play in a previous round — relative to their opposition — was worth 0.2 wins across a seven-game series. So with the Thunder having played four games and the Lakers having just finished a seven-game series, that three-game difference would have an estimated worth of 0.6 wins to Oklahoma City. In a way, though, the picture’s a little too big with this analysis. When people say that an NBA team’s going to be rusty after time off, they’re not suggesting that the well-rested team is going to forget how to rotate on defense or be stiff-legged when they jump for a rebound. They’re basically implying that the team isn’t going to shoot as well as they would while in the rhythm of steady action. We can also see if rust manifests itself strictly in terms of shooting. Since we want to measure both shooting from the floor and on free throws, we’ll use True Shooting Percentage as our metric. The legendary formula for TS%, of course, is Points divided by (2 times Field Goal Attempts plus 0.44 times Free Throw Attempts). The Thunder led the league with a .582 TS% this past season, while the league average was at .542. If teams got rusty after their time off, we would expect to see a notable decline in the shooting performances of teams with long rests as opposed to those playing constantly. History doesn’t exhibit such a gap. Teams with zero to three days of rest in the playoffs have produced a True Shooting Percentage of .532; teams with four or more days of rest have shot a virtually identical .529. If we limit the zero-to-three group to just those teams who also eventually played at least one game on four days’ rest, the difference grows, since those teams shot at a .542 rate when they were in our “steady action” group. That difference is the first sign of life for the rust theory. However, remember that there’s also a bit of bias working against those teams, too; to get a lengthy rest in the playoffs, you need to advance past Round 1. When you advance past Round 1, you’re likely to get tougher competition than you did in the previous round, and that tougher competition is likely to play superior defense, reducing your shooting percentage in the process. In the game after their first game following the lengthy break — in other words, once those teams on long rest got back into the flow of things, but still had to play the tougher competition that had induced the decline in their shooting percentage we noted above — our well-rested teams produced a True Shooting Percentage of .535. The six-hundredths difference between that figure and the .529 rate from their first game back represents the best case for the idea that rust exists, and it’s not much of a case at all. Let’s consider one other way that rust might appear on the fingertips of shooters: a disaster game. If the idea of a rusty team is really that accurate, there should be the occasional game where they come back from their deserved rest and simply can’t get anything to fall. Then again, there are games throughout the regular season and playoffs where teams simply have a bad shooting night on normal or even no rest, so we can’t just automatically look for disastrous shooting games from well-rested teams and automatically assume that it’s rust. So what we have to figure out, then, is whether a team coming off of a long break is more likely to have a disastrous shooting night than one playing every other night. We can test for that. We’ll define a disaster game to be one where the team in question puts up a shooting performance in the bottom 10th percentile. That ends up being every game where a team posted a TS% of .425 or worse. Keep in mind that the Bobcats were the worst-shooting team in the league this year and had a True Shooting Percentage of .497; we’re talking about truly wretched performances here. Teams with four or more days of rest between games during the playoffs have shot at a .425 rate or worse in their first games back 10.1 percent of the time. Teams with zero to three days of rest before a given playoff game have shot at a .425 rate or worse … 10.0 percent of the time. That simply won’t do. You can mention rust or use it as an excuse all you want, but the reality is that there’s scant evidence of it existing as a problem for NBA teams. The Thunder’s performance on Monday night was simply the latest example.